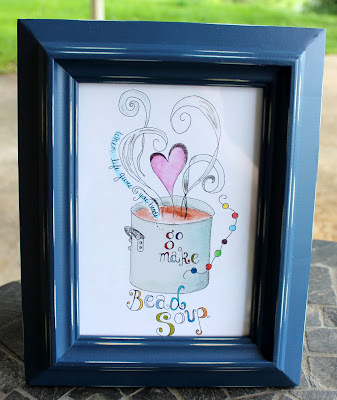 Spice Box Designs: A Mini Cup of Bead Soup Reveal! A Mini Cup of Bead Soup Reveal! If you follow my blog you probably know by now that I was one of the 3 lucky ladies that was randomly chosen to participate in Lori Anderson's New Mini Cup of Bead Soup. I am super excited to be able to join in this and I hope you enjoy what I made. 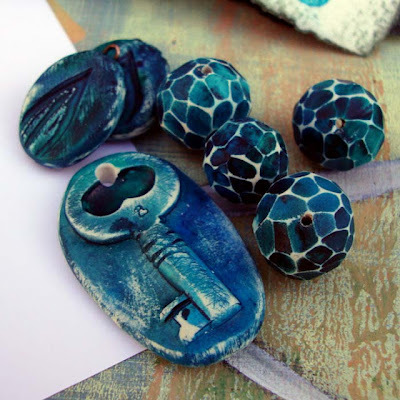 These are the amazing polymer clay beads that we got to play with that are made by Barbara Bechtel of Floridity. I am really happy with the way that it turned out. I was really stumped on what to do with the beads as it was the first time I had ever seen, much less held a polymer clay bead. I wrapped a cloth headband that I purchased at a dollar store with some beautiful Sari Silk remnants. I used size 8/0 and 11/0 seed beads as well as 4mm Fire Polished Preciosa Beads. I did want to use the other beads as well so I wove a focal to use for a necklace. However before I was able to add the chain component I had a fall and fractured my right wrist (I am right handed). So sadly I was not able to finish the piece completely. I do want to share with you the focal and tender an apology that I was not able to finish it to the other ladies in the group. Oh wow, it is wonderful to see Barbara's beads incorporated into bead stitching. Really nice! The headband is so sweet and your daughter is a great model! I can't wait to see your finished necklace. Nice. Totally different from the others but beautiful. I love the headband! Your beadwork is wonderful. I do hope you heal quickly! I hope you did not damage your wrist to bad and that it heals quickly. I love what you did with the components of this challenge. 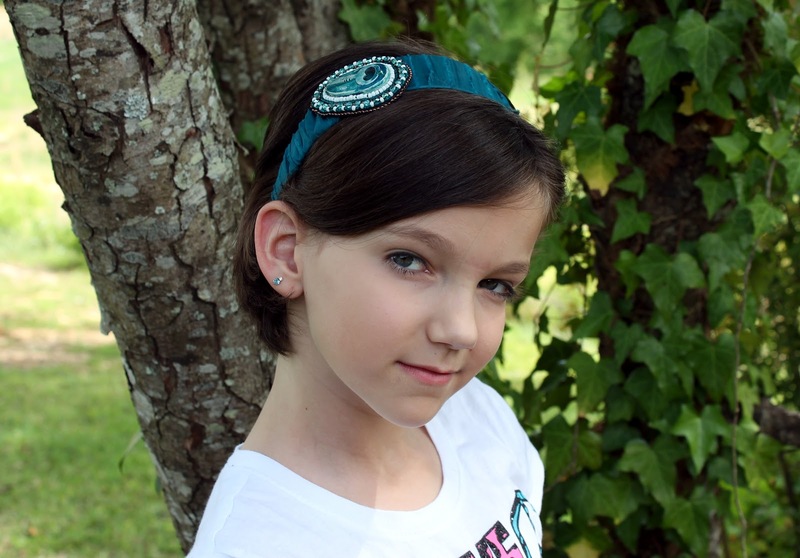 The head band is so pretty and looks marvelous on your daughter (she is very cute by the way). Even though you were not able to finish the necklace you had envisioned the pendant is beautiful. 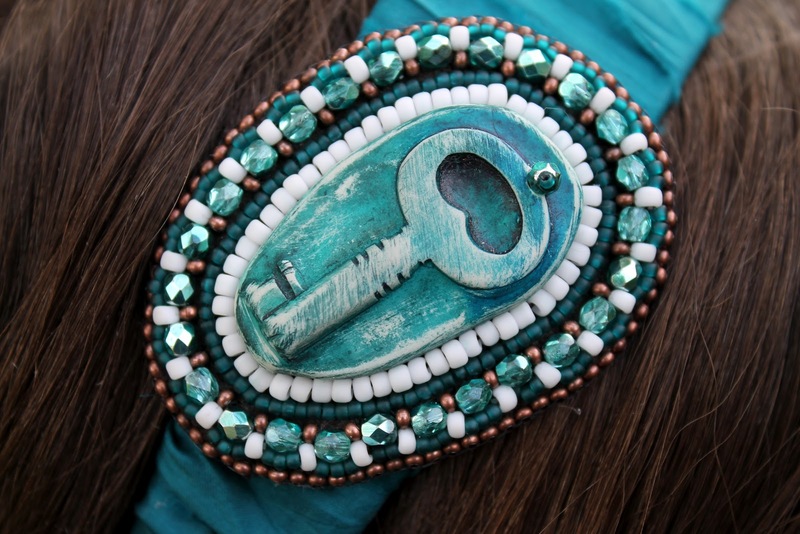 Not only is your beadwork AMAZING! but I LOVE that you created a headband, it's perfect and such a creative way to use that gorgeous focal. I'm totally gaga over your beadwork! I really like the bead embroidery on the headband .. so creative! I love your pendant and am so sorry you were hurt. I hope you heal soon. Oh Marla! I'm so sorry about your right hand! 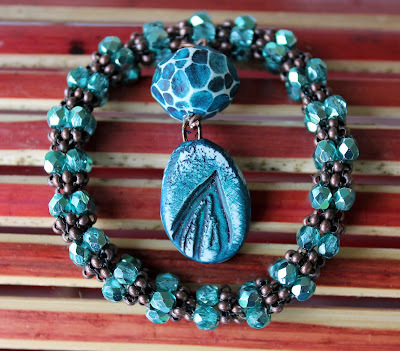 It is so exciting to see my beads used in beadwoven designs! I haven't seen to many other people attempt it! I am in love with the key headband! Really nice and such a pretty model! Make sure you send me photos when you finish the piece with the focal- although I think it would be pretty just on a plain chain!!!! Beautiful! Your daughter is a perfect model for that headband. I love the way you used that with the embroidery and the sari silk is perfect as a compliment. Hope you get better soon! First off, I'm so sorry about your wrist! And I can just imagine how disappointed you are to not finish. I'm so thrilled at that headband! What a great idea, and it turned out so pretty (of course, maybe that's because of the model). Your focal is fantastic, and I can't wait to see how you finish the piece when you are all better. Best wishes! WOW! That headband is so creative -- and the bracelet is so lush! I can't believe how differently we all worked with the same beads! WAY cool. Thanks for participating, and I'm sorry I was late with my comment but I was out of town. I'm in agreement with everyone else on the headband, it's just darling and so is your daughter:) Sorry to hear about your wrist. Heal fast! Sorry to hear about your wrist! Hope you feel better soon. I just love the headband you made. The focal is looking good as well. Can't wait to see the finished piece. So sorry about your wrist!! I hope you heal quickly! That headband is gorgeous! Truly love it! Beautiful work! I absolutly love your headband...it is really beautiful and your daughter was the perfect model. Hope your wrist heals quickly. That piece on the headband is so awesome! What a piece of work!!! I envy those that can do that! I have a book that gives instructions on how to do that, just haven't gotten to it yet! And I love the focal you made for the necklace! Hope your wrist heals soon! Can't wait to see the finished piece of work! 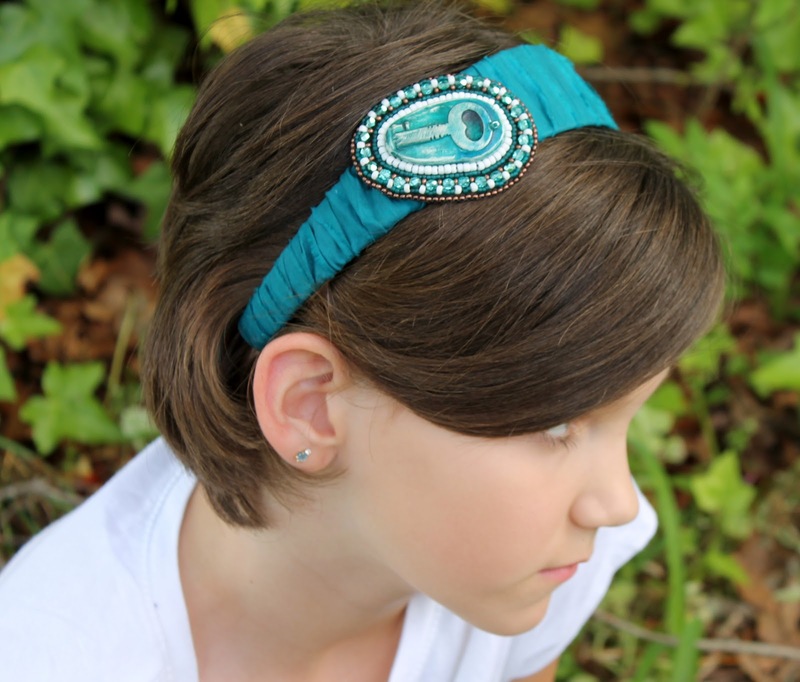 What a wonderful idea to make such a statement piece into a headband! This is gorgeous!!! Your work is just so fantastic and your color palette is beautiful. The necklace is going to be a real beauty too, as the focal is stunning. I hope you heal well and can get back to your beautiful beadwork soon. Good healing vibes sent your way, Marla!